This feature first appeared in Hyper issue #222, in April 2012. Voice acting in gaming is no longer the amateur’s department. Since developers started approaching games as a more cinematic experience, experienced actors are approaching the medium as a serious opportunity. The industry has reached a crossroad. With more developers embracing motion capture and facial recognition technology, a hybrid of theatre, film and voice acting is making actors a bigger part of the process than ever before. Video game characters are coming alive. While games may have used cheap voice actors to get the point across during the past two decades, the latest generation is adopting the principles of theatre to make movement and action a critical part of the entire gaming experience. The combination of more talented voice actors entering the industry and the emergence of motion capture and facial recognition technology is giving characters in games such as Uncharted, LA Noire and Red Dead Redemption an emotional resonance that has never before been achieved. Claudia Black, most well known for her roles in science fiction television, film and in gaming as Chloe from the Uncharted series, says the entire motion capture sequence is so involving that she actually stops focusing on her voice as her primary tool. Michael Abbott, who is chair of the theatre department at Wabash College in the United States and runs both the blog and podcast Brainy Gamer, agrees the industry has reached a crossroad, where theatrics, computer animation and voice work collide. Mark Meer, the voice of Commander Shepard in the Mass Effect trilogy, says this in turn is attracting more experienced actors. But the traditional role is changing. Actors are no longer simply voicing characters – they become them. Actors fully embody a role in motion, creating an emotional connection that can be far deeper than a character portrayed just through creating voices in a recording booth. Rob Wiethoff, who played John Marston in Red Dead Redemption, says listening is an actors’ craft – and motion capture allows them to actually see and feel what’s going on, making it easier to deliver a great performance. 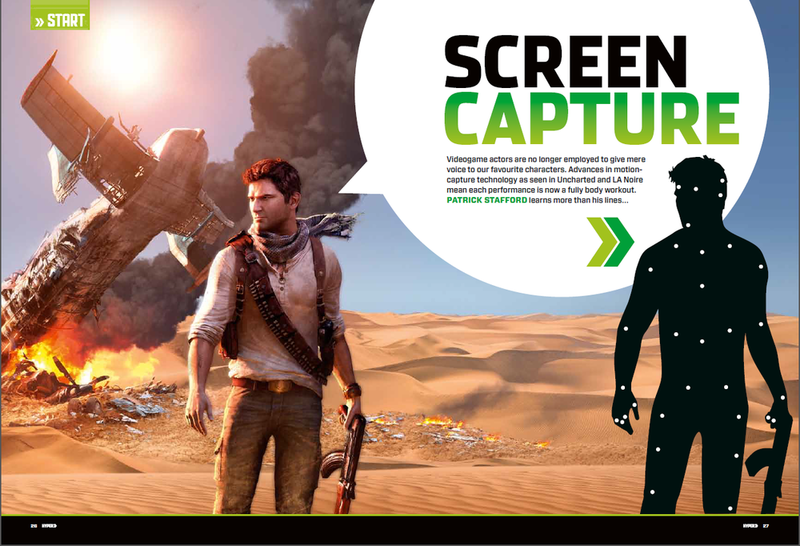 Motion-capture has been used in games for years, but mostly as a reference for random animations. It’s only relatively recently that developers such as Rockstar and Naughty Dog have started using it to harness great performances. Black, who has voiced characters in Gears of War and Dragon Age, knows well the difference between an isolated sound booth and motion-capture. She says the latter allows actors to do their best work. Part of the attraction, Black says, is the combination of theatre. Many of the actors involved in Uncharted have had some sort of stage training, and unlike many previous games, are now given the environment in which to experiment. Black says the ability to look at another actor, react to glances, looks and gestures is acting distilled to its most essential. Although motion capture can really help facilitate an actors’ movements in the game, it’s the facial recognition that really captures the essence of acting. Abbott points to scenes in Red Dead Redemption, where Wiethoff may have given no more than a glance, or a look, to show off some powerful emotion. Actors are very much used to telling stories with their eyes, and as more games adopt this approach, the more emotional range they can provide in their characters. As a result of all of this, voice acting becomes less important, eclipsed by real-time interaction. Even now, Meer says working alone in a booth puts you at a slight disadvantage. Wiethoff says that interaction is part of why the acting in games like Red Dead is such a success – these aren’t digital models interacting, they’re actual people. So how do games like Red Dead Redemption and Uncharted capture such real performances? A bit part of the solution is remaining natural, Black says, referring to Naughty Dog’s willingness to let the actors riff off the written material. If acting in games is going to adopt more of its style from theatre and film, these actors say developers need to be able to work on the fly. To do this, you need an accommodating developer that understands the process. Black wants more studios to take this approach. Black agrees, saying some of Uncharted’s best moments sprang out of that freedom for actors to make quips and comments that come to them naturally. “It just makes the whole process so organic,” she says. Certainly developers are continuing with motion capture. The latest trailer released from Naughty Dog for its new title, The Last Of Us, features some impressive motion capture work from actors. Andy Serkis, a champion of motion-capture who worked on Ninja Theory’s Enslaved, recently put forward the idea the Oscars should include a category for video games. But Abbott says there’s a long way to go, and this could come as developers start valuing the integration of writers and actors from the beginning of the development process. Black says the future of game acting lies in that relationship between the player and a character – a relationship that has existed for decades on film – and it will only be enhanced by quality acting and developers who understand that process. This is the connection that makes people cry when characters they have never met or known die on screen or suffer a tragedy. And more and more, developers are learning how to capture these experiences. Wiethoff says there was one scene in Red Dead Redemption that encapsulated this for him, and showed how the emotions created during gaming could be just as important and moving as emotions felt during a play. Towards the end of the game, Marston has been tracked down by the state. He puts his wife and son on a horse, and tells them to keep riding – knowing he very well may never see them again. Wiethoff says being able to look into the other actors’ eyes allowed the performance to become something much more powerful than digital models could represent.